These hydraulic four column presses from RHTC are built with a structure of four chrome-plated cylindrical columns with four lateral rails to ensure perfect alignment of the upper table. The presses with cylindrical columns are indicated to carry out efficacies like stamping, pressing and trimming in medium and high volumes. This 220 ton model has a double-acting cylinder with anti-wear guides and a table size of 1.640 x 1.040 mm, a vertical light of 750 mm and a piston atroke of 450 mm. The motorized two-speed hydraulic unit with automatic disconnection of the high speed has a selector for choosing between two speeds and a selector for choosing between manual or semi-automatic operation. Our hydraulic four column presses are made in Europe and can be designed to special requirements such as other table dimensions or a larger vertical light. 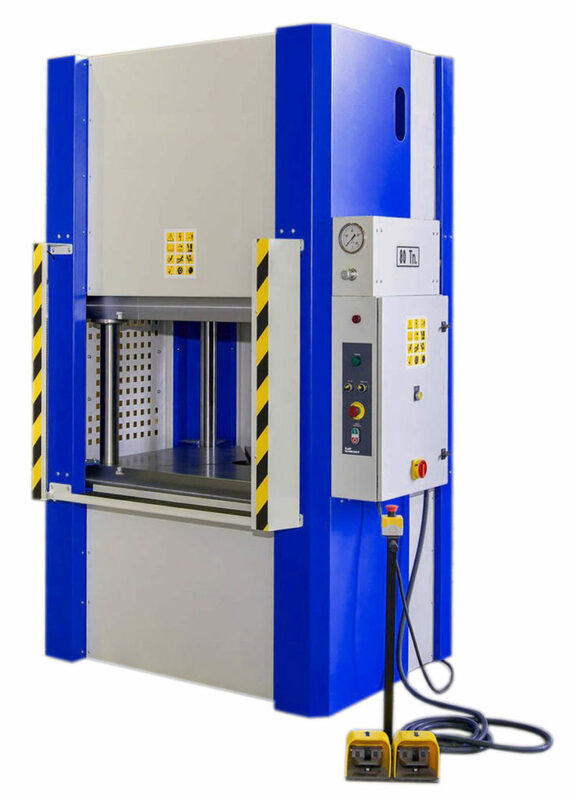 We guarantee a high quality of these hydraulic presses, because they fulfil the latest CE-regulations and therefore we give a warranty of two years on these four column presses.